Great course I will most definitely return on my next visit to Portugal.The greens are amazing best I have ever seen. Tough on some holes if you dont hit the fairway as lots of bushes you cant play out of but if you can hit a straight iron that is the best way. 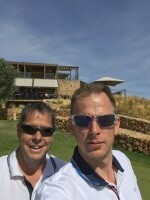 Great price great people great course you wont be disappointed this is a must play if you go to Portugal to play golf.. thanks Espiche golf see you again soon. Great course. Greens need attention but overall its a great place. To send Jamie a message, please log in to your account or sign in using Google or Facebook. Please Note! The message you send below is not private, we screen every message to ensure that our clients do not receive unsolicited emails or marketing emails. Your full name and email address will also be sent to Jamie.